This is about Białynicki-Birula's paper from '72 on actions of reductive linear algebraic groups on non-singular varieties, in particular Gm-operations on smooth projective varieties. I give a proof sketch of Theorem 4.1 therein and explain a little bit how Brosnan applied these results in 2005 to get decompositions of the Chow motive of smooth projective varieties with Gm-operation. Wendt used these methods in 2010 to lift such a decomposition on the homotopy-level, to prove that smooth projective spherical varieties admit stable motivic cell decompositions. Most of this blogpost consists of an outline of the B-B paper. The paper is essentially about algebraic torus actions on varieties and relating the induced action on the tangent space of a fixed point to the variety itself. The most simple torus is just the multiplicative group (think of or ). In classical Morse theory, one considers "Morse functions", which are a particular kind of function , and their gradient flow, which is the flow associated to the gradient vector field. Such a flow is nothing but a -action! Where the Morse-theory people look at smooth manifolds and apply the exponential function from the tangent space (of a critical point of the Morse function, i.e. a fixed point of the flow) to the whole space , an algebraic geometer has to do something else (as the exponential function is not algebraic). This something else is a gimmick invented by Białynicki-Birula. With this gimmick, a -action with isolated fixed points provides a cell decomposition, like the CW decomposition from classical Morse theory. We work over an algebraically closed field . Let be a quasi-affine algebraic scheme and a nonsingular closed point. We denote by a reductive algebraic group, though in the end only the 1-dimensional torus is relevant. Given a -action on a scheme with fixed point , the tangent space gets a natural -action. For any vector space with -action there is a decomposition into the weight-graded pieces. I call the action definite if either the minus- or the plus-part vanishes, and fully definite if also the zero-part vanishes. Theorem 2.1: Given a reductive group acting on with a closed irreducible -invariant subscheme containing a closed fixed point nonsingular in and , to any -invariant subspace of the tangent space that contains one can find a closed irreducible -invariant subscheme that contains and has the prescribed tangent space. (This is what I consider a replacement for the exponential function). Proof idea: The maximal ideal corresponding to maps -equivariant surjective to . Denote by the tangent space of and by the ideal corresponding to . Since is reductive, there exists a -submodule that maps isomorphically to . Then is an ideal in , so the corresponding closed subscheme of has an irreducible component containing . By construction, . Uniqueness of the subspace is also discussed in Theorem 2.2, in particular we have a Corollary to Theorem 2.2: Let act on with fixed point . If is either the positive, the negative, the non-negative, the non-positive or the zero-part of the graded vector space , then there exists exactly one closed, irreducible and reduced -invariant subscheme through such that is non-singular and . Theorem 2.4: Given for sequences of closed immersions of -invariant subschemes of quasi-affine algebraic -schemes and a -isomorphism , such that the -modules and are isomorphic, there exists such a sequence and étale -morphisms that map onto an open subscheme of . Proof idea: Inside embed as and are étale at , hence over a smaller subscheme that still contains . Denote by in , then and do the job. 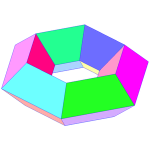 Theorem 2.5: For any torus acting on such that is a fixed point and the induced action on is definite, there exists a -invariant open neighborhood of which is -isomorphic to , with a finite-dimensional fully definite -module. Proof idea: The arises as the complement of . WLOG (as one can show) is reduced, irreducible and acts effectively. Apply Theorem 2.4 to , , , , , , then the resulting are not only étale, but also birational (as one can show), hence open immersions. Then contains an open subscheme -isomorphic to for some open beighbourhood of in and is frequently used. This is a device to handle generic points without talking about prime ideals, which I explained in this blog posts about points. Given a -rep one defines the notion of an -fibration , which carries a -action on and Zariski-locally on looks like , with -action induced by . We call the dimension of the -fibration. One should remark that an -fibration needn't be a vector bundle, since there might be more -equivariant automorphisms of than the linear ones. The following gives us a uniqueness property for -fibration-structures on maps . Corollary to Proposition 3.1: For any torus acting on a nonsingular , two -representations for and -fibrations (respectively), then is equivalent to . If furthermore is a -fixed point and is definite, then . Proof idea: For any closed point , as -modules, , so the are equivalent. Note that the in is uniquely determined, since there is no nonzero -homomorphism . By (the corollary to) Theorem 2.2 there exists exactly one -invariant subscheme with nonsingular and , but and both fulfill these conditions, hence . This shows . We call a morphism with -action on a -fibration if it is Zariski-locally over an -fibration for some -reps . If the dimensions of the all coincide, we call that number the dimension of the -fibration. Now, let and any non-singular reduced algebraic -scheme that can be covered by -invariant quasi-affine open subschemes (for example any smooth projective will do, maybe normal quasiprojective suffices, by Sumihiro's equivariant compactification). for any closed fixed point , the tangent space is and the dimension of the -fibration is . Proof idea: Let . By Theorem 2.1 there exists a closed -invariant irreducible subscheme -stable nonsingular subscheme and is a trivial -fibration. Using the Corollary to Theorem 2.2 and the Corollary to Proposition 3.1 (the uniqueness statements) we know for that and for any third fixed point we have . Since every is noetherian, we find such that , so is a -invariant, locally closed subscheme of and a -fibration can be uniquely glued together from the . Actually, there is also a minus-decomposition, where you use instead. The interplay of these two decompositions for the same -action is explained in Theorem 4.2: Let act on a quasi-affine . For a rational point , the orbit closure intersects a connected component in a non-empty set iff or . Moreover, for all connected components. Proof idea: The direction is clear. For the other direction apply Theorem 2.4 to , , , , , . For we have . Only one contains and one can show (using again Theorem 2.1 and 2.2) that actually and . Moreover, from we get . Theorem 4.3: Let act on a complete nonsingular algebraic -scheme , with the decomposition of the fixed points into connected components. Then there exists a unique locally closed -invariant decomposition and -fibrations such that and for any closed fixed point , . Proof idea: Take the plus-decomposition from Theorem 4.1, then what's missing for the statement ( for and ) follows from analyzing orbit closures (that is actually Theorem 4.2 together with Lemma 4.1 which I didn't include in this summary). From this follows Theorem 4.4: If the -action in Theorem 4.3 has isolated fixed points, then any is isomorphic to an affine space . 3) The relative dimension of is the dimension of for any . I want to remark that any generalization of this theorem to quasiprojective or singular situations would be a very impressive result. The only generalizations I know of are papers of Skowera and Choudhury on Deligne-Mumford stacks and papers of Carrell and Sommese on the Kähler analogue. Let be a smooth projective variety over a field , equipped with a filtration where the are closed subvarieties, and affine fibrations of relative dimension . Then the Chow motive decomposes . Let be a smooth projective -variety over a field . Then , where the are the connected components of the fixed point locus . For a projective homogeneous variety (for a reductive group) over a field , the kernel of the map consists only of nilpotent elements. Brosnan proved more, in particular how the motive of decomposes, using this method: , where is length and is the set of minimal length coset representatives of , with the set of roots corresponding to and the set of roots that are killed by a non-central cocharacter of the maximal torus (taking care of the possible non-splitness of the maximal torus). Using the BB-decomposition, one gets a decomposition of the motive. Actually, one gets a bit more, namely a decomposition in the stable A¹-homotopy category. This is even more analogous to CW decompositions coming from Morse theory. What you need for a cellular decomposition (in the homotopy-theoretic sense), but what's missing in a direct sum decomposition of the motive, are the gluing maps. One has to extract these gluing maps from the BB-decomposition. This was done by Wendt, who used this approach to show stable cellularity of connected split reductive groups and their classifying spaces, as well as stable cellularity of smooth projective spherical varieties under connected split reductive groups. As this post is already too long, I might explain the motivic cell structures in another post. Actually, you can just take a look at the preprint. It remains to see how these cell structures look like explicitly!